Life in your body is pretty cool. Your body carries you through gravity, from sunrise to sunset and back again. It’s only in a body that you’re able to taste amazing food, clamber up the sides of mountains, unfurl yourself into yummy-feeling yoga poses, lift satisfyingly heavy weights, give and receive snugglehugs and take a flying cannonball leap into a swimmin’ hole. Those of us who skydive are incredibly grateful that we have bodies to fly. But there’s another space to explore, outside the simply physical. You can look at skydive in another way entirely: As a phenomenon so powerful in the inner sense that it feels like an out-of-body experience. Especially for new skydivers–tandem students, in particular–the challenge of skydiving is much more mental than physical. After all, a first-time tandem skydiving student necessarily has to trust the process in so many aspects, physically tossing him or herself into the unknown. A big part of the recipe that cooks up to the spiritual experience of a skydive is, predictably, neurochemical. Skydiving, it seems, has superpowers which ratchet the effects of this chemistry far beyond the more “normal” adventures (for example: roller coaster rides). 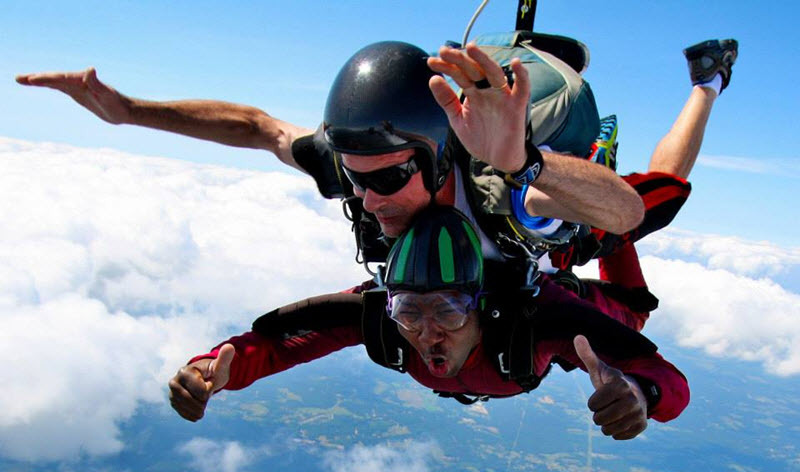 Many–but certainly not all–people who participate in extreme sports like skydiving claim they do it for the “rush.” In that statement, they’re probably referring to the adrenaline rush, which tsunamis over the body whenever the body interprets that it’s in danger. The “fight or flight response” is a well-known phenomenon, and every kid learns in school that it seems evolutionarily intended to keep you out of harm’s way. So you learned about fight-or-flight in gradeschool. Awesome! Now: Have you ever experienced it in a controlled-variable environment? We’re not talking about your experience of negative, scary things in your life that you had no control of (though you certainly had a fight-or-flight response to that car accident, or that barroom brawl in college). We’re talking about a place to experience the full glory of the fight-or-fight response on your own terms. Here’s how it happens: Your heart rate goes up. Your pupils dilate. Your breathing speeds up (so you’ll have to breathe deeply and regularly to even it out). Your skin will tingle. Your head may feel light and loopy. As all this happens, you’ll be standing under a waterfall of endorphins and dopamine, the neurochemicals which control euphoria and the experience of pleasure. You’ll feel courageous–strong–connected–and, most of all, inspired. These sensations are strong enough to feel like an out-of-body experience. For serious. It sounds crazy to have something like that on tap, but believe us when we tell you that it’s a real thing. Who needs comfort zones, anyway?! Make your reservation today and we’ll show you how good life can be outside your comfort zone–and outside your day-to-day physical world!